Fire officers say sprinklers were key to limiting the spread of a major fire at the ASOS warehouse near Barnsley. South Yorkshire Fire & Rescue Head of Prevention and Protection Phil Shillito, said: "The fire suppression systems installed by ASOS were sophisticated, worked effectively and played a significant role in reducing the spread of the fire in its early stages. Sprinklers are the most effective way to ensure that fires are suppressed or even extinguished before the fire service can arrive. They save lives and reduce injuries, protect firefighters who attend incidents and reduce the amount of damage to both property and the environment from fire. Currently, only warehouses and certain other commercial premises greater than 20,000m3 must have sprinkler systems installed. The fire service, through the Chief Fire Officers Association (CFOA), is currently campaigning for this threshold to be lowered. Fire broke out at the 60,000 square metre site on Park Spring Ring, Grimethorpe at around 10pm on Friday (20 June). Ten fire engines and more than 60 firefighters helped put out the fire, which is estimated to have caused millions of pounds worth of damage in lost stock. But the damage could have been even greater had the building not had a sprinkler system, with the fire service urging more businesses to invest in sprinkler systems to protect their assets. 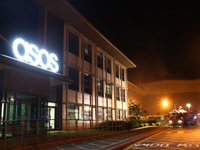 The fire at the ASOS warehouse involved four floors and is believed to have been started deliberately. Yodel clears backlog but is there a deeper problem?